The Adelaide City Council has all-but destroyed its chances of making Adelaide carbon neutral by indefinitely shelving any purchase of carbon offsets, in an embarrassing blow to Lord Mayor Martin Haese. South Australia's economy is middle-ranked. The council last night unanimously voted to delay any purchase of carbon offsets until after “all cost-effective and reasonable measures to reduce city emissions have been exhausted”. Modelling commissioned by the Environment Department last year showed that about 400,000 tonnes of carbon dioxide emitted from the CBD and North Adelaide would need to be removed using carbon offsets to meet the council’s carbon neutral goal by 2025. By 2050, according to the model, more than 20 per cent of the emissions reduction task would still have to be achieved by purchasing offsets. 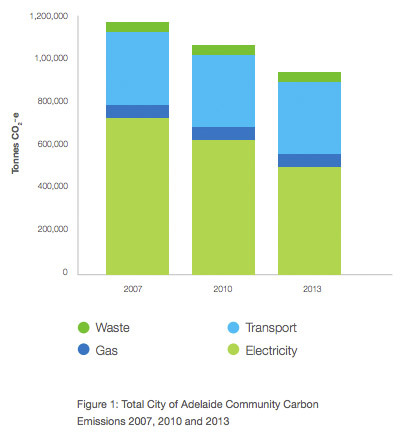 Without carbon offsets, in other words, carbon neutrality appears beyond Adelaide’s reach for several decades. Professor Corey Bradshaw, of the University of Adelaide’s Environment Institute, told InDaily this morning it would be impossible for Adelaide to become carbon neutral by 2025 without carbon offsets – and very difficult, even with them. “It would be extremely difficult to get that down without any sort of offsets,” said Bradshaw. The City of Adelaide could reduce its carbon emissions by 68 per cent by 2050, according to the Pitt&Sherry model – but carbon offsets would still have to be bought each year in order for the CBD and North Adelaide to be considered “carbon neutral”. Controversy erupted within the council last week when it was revealed the council had spent about $25,000 on accredited carbon offset projects in recent years – involving the conservation of old-growth Tasmanian forests – as first reported by InDaily. These carbon offsets involved signing contracts with landowners preventing any land clearing for an agreed number of years. Buying those offsets reduced emissions from the council’s own buildings and operations by about 4000 tonnes of carbon dioxide. But councillors Anne Moran and Phil Martin argued it was a waste of money for the council to conserve trees in Tasmania and that it should be doing all it could to reduce emissions in its own patch first, or instead. “Our ratepayers are screaming out for trees in the city of Adelaide,” Phil Martin told the meeting, adding that the council had not yet implemented reforms in waste management, fossil fuel divestment or energy saving streetlights (although an LED smart-lighting trial is underway on Pirie Street) and that the council should do all it could to reduce its own emissions before considering buying interstate offsets. Moran said she supported carbon offsets, but that they were the remit of higher levels of government. Lord Mayor Martin Haese told last night’s meeting the council would need to plant more than one million trees in its jurisdiction to achieve an equivalent carbon reduction to that achieved by purchasing the Tasmanian offsets since 2013. He also pointed out that no accredited carbon offsets were available for purchase in South Australia. “If I wasn’t laughing I would be crying,” he remarked when the unanimous vote was confirmed. Haese this morning played down the significance of the decision and insisted he was “comfortable” with it – but agreed carbon offsets were “an absolute necessity” for Adelaide’s carbon neutral ambitions. And he said the wording of last night’s motion gave him confidence that offsets were not entirely off the table. “Last night’s decision I am comfortable with,” said Haese. “The fact that the word ‘reasonable’ is in there, I must say, gave me confidence,” he told InDaily this morning. He said research into the benefits of carbon offsets for Adelaide would soon be completed and presented to the council. “If and when there will be a contemplation of buying carbon offsets … the most important question then, to ask, is: ‘what is the benefit to the city?’” he said. “If the benefit … comfortably exceeds the cost of the offsets, that’s something that we [should] look at very closely. He said he wanted to see the benefits of carbon offsets quantified as much as other councillors did. Carbon neutrality had “the potential to make Adelaide more competitive on the world stage … that’s why it’s so crucial that we do it with absolute authenticity”. He said the city needed to do as much as was possible to reduce its own emissions before purchasing offsets, but that “I don’t think we can do it without offsets”. “Carbon offsets aren’t evil, carbon offsets are an investment in sustainability”. Haese added that accredited carbon offsets were not available in South Australia and it was “entirely appropriate” that they be purchased from “a close neighbour” – Tasmania. A council spokesperson told InDaily last week that the council had saved ratepayers about $800,000 each year by the improving the energy efficiency of council-owned buildings between 2009-10 and 2014-15. Those efficiencies reduced carbon emissions from the council’s business operations by 31 per cent – from 23,932 tonnes of carbon dioxide each year to 16,601 tonnes – over that period. The council’s stated goal is to make its own operations carbon neutral by 2020 and for the CBD and North Adelaide to become “the world’s first carbon neutral city by 2025”. The council and the State Government are due to release a detailed joint plan to reduce carbon emissions within the city of Adelaide, to achieve the carbon neutral goal, in November. 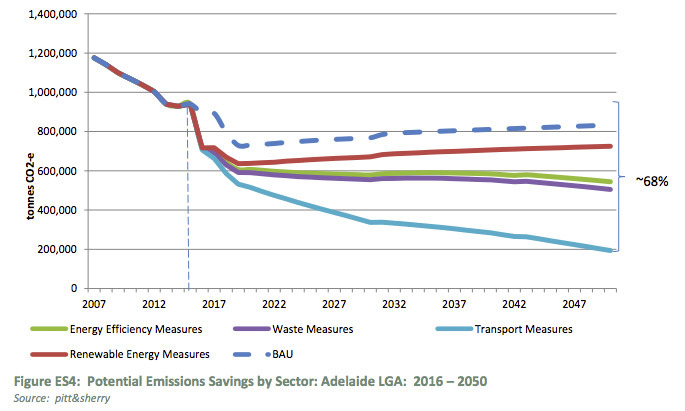 It is unclear whether the Carbon Neutral Action Plan for Adelaide will detail the quantity or cost of offsets required meeting the council’s goal, or the State Government’s goal. The ambition of the latter level of government is for Adelaide to become “the world’s first carbon neural city” without specifying a particular year. It remains unclear what share of the carbon neutral task – including the purchase of carbon offsets – would be achieved by which level of Government. Central Ward councillor Houssam Abiad was absent for last night’s debate. Area Councillor Natasha Malani left before the carbon offsets debate begun.